The most significant achievement in the last forty years of American cinema. 549 min. Paramount Pictures. Director: Francis Ford Coppola. Cast: Marlon Brando, Al Pacino, James Caan, Richard S. Castellano, Robert Duvall. Simply put, The Godfather films represent the most significant achievement in the last forty years of American cinema. Spielberg and Lucas nipped at Francis Ford Coppola's heels with Jaws and the Star Wars saga, which in their way also indisputably transformed the landscape of popular cinema. But Coppola's richly textured epic of the American experience as seen through a crime-syndicate family touches on personal drama and national themes with a potency not felt since Citizen Kane. It's no surprise, then, that the American Film Institute ranks Welles' crowning achievement and Coppola's as the first and second greatest achievements in American film. The three films that comprise The Godfather trilogy earned a collective 29 Oscar nominations and 9 wins, including two for Best Picture and one for Coppola as director. The first two films, made in the 1970s, were unprecedented, as was the second sequel made in 1990, which reunited most of the key talent from the earlier, epochal films. Thanks to a tenacious Coppola, The Godfather also provided the definitive screen breakthrough for Al Pacino (whose only previous film was 1971's The Panic in Needle Park). The lush period photography by Gordon Willis remains a high water mark of America cinema, and Nino Rota's beautiful themes are as much a part of the national consciousness as the thoroughly dissected screenplays by Coppola and novelist Mario Puzo, on whose novel the films were based. Film fans hold spirited debates to this day about which film is superior—1972's The Godfather or 1974's The Godfather Part II—and whether or not 1990's The Godfather Part III is a worthy entry in the canon. The Godfather: The film that started it all turned out to be an clarion call for honoring art over commerce. At every turn, Coppola was second-guessed and brow-beaten by a nervous studio, but he stuck to his guns to deliver a film so popular it was instrumental in rescuing Paramount. Among the gambles: the unknown Pacino in the lead as Michael Corleone, the reluctant scion of a Mafia family, and Anglo-Saxon acting legend Marlon Brando, whose stock was then low, as the full-blooded Italian godfather Don Vito Corleone. The Godfather is an indelible classic, shot for shot, word for word, and note for note. Brando and Pacino are brilliant, and they get sterling support from James Caan, Robert Duvall, Diane Keaton, John Cazale, Talia Shire, Richard S. Castellano, Abe Vigoda, Alex Rocco, and Sterling Hayden. The film is a masterpiece of story and incident (think family wedding, horse's head, toll booth, cannoli, the unforgettable assassination sequences and the devastating finale), but also of big themes: the comparability of criminal conspiracy, corporate capitalism (including Hollywood), and politics; the weight of family; and the vulnerability of moral fiber under the high pressure (and in the cultural landscape) of all of the above. To Coppola, Puzo's gangster story was a vehicle to explore a Shakespearean story of kingly succession and the story of America as a land not only of proud immigrants, but of unlimited potential for corruption through the availability of the American dream. The Godfather Part II: With his accumulated clout, Coppola agreed to embark on an even more ambitious sequel. Fraught with its own set of problems, including down-to-the-wire contract negotiations that sidelined Brando and Castellano, the continuation of the first film found an audacious narrative structure that counterpointed the rise of Michael Corleone in the late 1950s to the rise, circa 1917, of his father Vito (now played, with what would become trademark intensity, by a still up-and-coming Robert De Niro). The whole film, then, captured the brilliance of its predecessor's denouement in enriching character and theme through sustained juxtaposition: in this case, a father and son at roughly the same age and dealing with the same concerns. The resulting tragic sense of destiny took The Godfather Part II to new heights while still doing exploring the same themes and narrative territory as the first film: the dangerous Mafia intrigue, the troublesome "love" story between Michael and Kay, the structures of American commerce and power, and the soul-rending multiple obligations of ambition and blood. The latter theme becomes one of the film's most potent, as the increasingly cold Michael puts the crime family before his immediate family, as represented by Kay and Michael's brother Fredo (the masterful John Cazale, who would die tragically young just four years later). The Godfather Part III: Round robin competitions of greed, trepidation, and artistic impulse eventually resulted in this sequel doomed to be unfavorably compared to the original, note-perfect films. Nevertheless, The Godfather Part III is a largely underrated film that provides justifiable, sensible, symmetrical closure to what was always an epic concerned with generational patterns. With Pacino back as an aging Corleone forced to face up to his lifetime of sins on top of the day-to-day pressures as the patriarch of his intertwined family and crime family, the third film captures a fresh sense of tragic angst. The film comes with a set of challenges including the absence of Robert Duvall and the last-minute drop-out of Winona Ryder as Michael's daughter. Ryder was replaced by Coppola's daughter Sofia, whose much-maligned performance sadly isn't up to par, but is hardly ruinous. Andy García (as the son of Caan's character), Eli Wallach, Joe Mantegna, George Hamilton, and Bridget Fonda all make valuable contributions. One of the film's oft-overlooked raisons d'etres is Coppola's treatment of religious faith juxtaposed with the hypocrisy and corruption of the Vatican Church (tied to Italian banking scandals), another institution with key influence on American life. 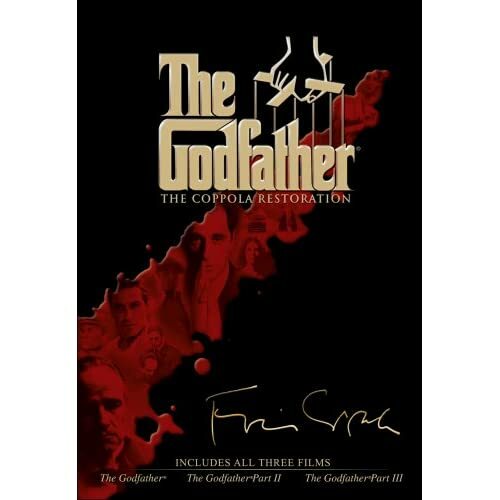 Appropiately, Coppola revisits narrative patterns to allow the saga ultimately to dovetail in The Death of Michael Corleone" (Coppola's intended title for the film). When the year-end lists for best home video are made, you can bet that Paramount's The Godfather: The Coppola Restoration will be on them. 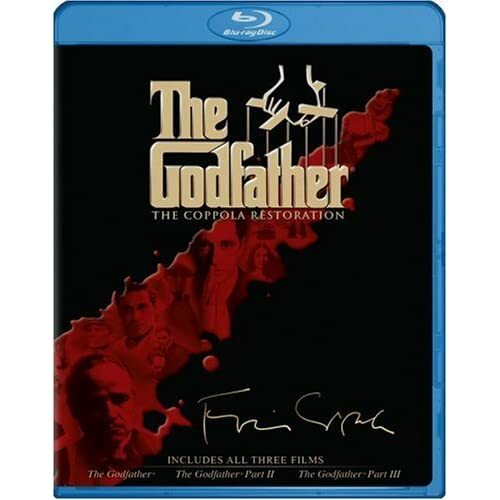 The Godfather has been one of the studios' most popular and reissued titles, on videodisc, Beta, VHS, laserdisc, and DVD. The latest issue on DVD and high-definition Blu-ray makes every previous issue obsolete and certainly seems to be as good as it gets. The four-disc Blu-ray set devotes a disc to each film (and its attendant commentary by Francis Ford Coppola) and a fourth disc to an large array of bonus features, including several new featurettes (in HD) and all of the extras from the 2001 DVD collection. The superior image quality owes to a restoration supervised by Robert A. Harris with the input of Francis Ford Coppola and cinematographer Gordon Willis. The Godfather films are meant to have a somewhat aged look, a light softness, a golden glow (they are not, however, meant to look as they have in previous editions: dull, dirty, washed out, lacking in detail, or marred by digital compression artifacts). Harris' frame-by-frame restoration from the best available elements (detailed in the bonus features) scrubs each image and attentively calibrates it to conform to Willis' original intent. The films still look like film (good!) of their respective times, with the 1990 film naturally a bit cleaner; all three transfers reveal maximum detail and with the true blacks essential to preserving Willis' painterly photography. The brand-new extras, all presented in HD on Blu-ray, begin with "The Masterpiece That Almost Wasn't" (29:46), an entertaining retrospective on the anomaly that was The Godfather with comments by Coppola, George Lucas, Walter Murch, former Paramount production VP Peter Bart, film critics Mick LaSalle and Kenneth Turan, former Paramount production chief Robert Evans, William Friedkin, Steven Spielberg, John Turturro, Richard Belzer, Kimberly Peirce, Trey Parker, David Chase, Joe Mantegna, Alec Baldwin, and Guillermo del Toro. "Godfather World" (11:19) further explores the film's cultural impact, with reminiscences and reflections from Coppola, Mantegna, Seth Isler (of the one-man show The Godfadda Workout), Belzer, Baldwin, Chase, Friedkin, LaSalle, Parker, del Toro, Sarah Vowell, Stevie Van Zandt, and Spielberg. "Emulsional Rescue: Revealing The Godfather" (19:05) delves into the recent restoration process with Coppola, Willis, Allen Daviau, Spielberg, Harris, Paramount Post-Production executive VP Martin Cohen, and several of the technicians who worked on the project; I could have done with an even more detailed look at the process, but this is a very nice overview. "...when the shooting stopped" (14:18) addresses the editing of the films, with some interesting anecdotes about the crafting of music cues and the delicate structuring of Part II. Participants include Coppola, Lucas, Murch, Spielberg, and Part II co-editor Richard Marks. "The Godfather on the Red Carpet" (4:03) is a silly E!-style red-carpet roundup, asking young celebrities at the Cloverfield premiere for their thoughts on the trilogy. Interviewed are T.J. Miller, Drew Goddard, John Cho, Matt Reeves, Jennifer Morrison, Anton Yelchin, Lizzie Caplan, Harold Perrineau, Jessica Lucas, and Natasha Henstridge. Of more interest are "Four Short Films on The Godfather" (7:20 with "Play All" option), which are outtakes from the interviews done for the featurettes. The first features Turan, LaSalle, Chase, Marks, Vowell, and Turturro offering miscellaneous comments. The second is a fanboy confab between Belzer and Isler. The third is all about the cannoli, with Coppola and Vowell, and the fourth finds Coppola answering a question about Clemenza posed by the book How to Really Watch The Godfather. Snazzed up for Blu-ray are The Family Tree and Crime Organization Chart, text-based interactive charts clickable to reveal character dossiers and actor bios (the arguable flaw being that the bios come from the 1971, 1974, and 1990 press notes and go no further). Connie & Carlo's Wedding Album is a nice still gallery focused on the first film's first scene. The new sets also include the complete 2001 DVD Archive, still an impressive treasure trove from the well-kept Coppola archives. The menus include rare behind-the-scenes audio snippets from script meetings and rehearsals, and the primary making-of documentary resides here: "A Look Inside" (1:13:29). Produced at the time of The Godfather Part III, this doc provides priceless candid looks at behind-the-scenes footage, including screen tests (James Caan and Martin Sheen as Michael, Robert De Niro as Sonny) and story meetings. Interviewed at length about the development of the three films are Coppola, Mario Puzo, Al Pacino, Caan, Robert Duvall, producer Fred Roos, Murch, producer Fred Fuchs, De Niro, Shire, Eleanor Coppola, Eli Wallach, Andy Garcia, Paramount chairman Frank Mancuso, Mantegna, Sofia Coppola, and Gordon Willis. Among the many other tidbits to be found in the numerous galleries and menus are the featurettes "On Location" (6:56) with production designer Dean Tavoularis returning to the shooting sites and "Francis Coppola's Notebook" (10:13), in which the director reveals his unique prompt book containing Puzo's novel and Coppola's notes. There's a section on The Music with featurettes on "Nino Rota" (5:30) and "Carmine Coppola" (3:17). Other key aspects are explored in "Coppola and Puzo on Screenwriting" (8:07) and "Gordon Willis on Cinematography" (3:45), which includes comments by peers Michael Chapman, Conrad Hall, and William A. Fraker. The vintage featurette "The Godfather Behind-the-Scenes 1971" briefly interviews a grab bag of Caan, Al Martino, Pacino, Morgana King and Richard Castellano. A terrific addition are several of the Oscar wins and acceptance speeches, as well as Coppola's introduction to the 1974 airing of the first film. With the Blu-ray edition actually cheaper from Amazon than the DVD set, this awesome special edition of a film classic is an investment worth making for any film devotee. All site content © 2000-2019 Peter Canavese. Page generated at 04/20/2019 08:51:58AM.